Deanna speaking at Emory University for their Reformation at 501 event last October. Deanna discussed her new book, Glimpsing Resurrection: Cancer, Trauma, and Ministry, at Gloria Dei Lutheran Church in St. Paul, Minnesota. September 2018. Deanna launched her new book, Glimpsing Resurrection: Cancer, Trauma, and Ministry, in August 2018, at Hamline University. In May 2018, Deanna received the John Wesley Trustee Award given by Hamline University’s Board of Trustees. This award is given to faculty who serve and lead in the spirit of the words of John Wesley (“Do all the good you can, in all the ways you can . . .) by demonstrating core values of high quality and vigorous academics, a commitment to making the world a better place, and an embodiment of ethics and civility. Deanna led a two-week session on Faith and Living with Cancer at Zion Lutheran Church in Anoka, MN, February, 2018. Deanna preached on the Virtual Body of Christ on Transfiguration Sunday at Lake Park Lutheran Church in Milwaukee, February, 2018. Deanna led a two-day retreat for the Theology and Philosophy Faculty of Mount Mary University, Milwaukee, on Teaching, Virtuality, Trauma, and Race, February 9-10, 2018. “Amid this Season, Sorrow,” was published in the Minneapolis Star Tribune on Christmas Day, 2017. Read the story here. Deanna was one of the speakers at the Nordic American Thanksgiving Breakfast, November 21, 2017. Deanna was interviewed in Bearings Online, October 2017, in the article titled “Christ of the Facebook Page.” Read the interview here. Deanna was the 2017 speaker for the Perry Gresham Lectures hosted by Central Woodward Christian Church and Christian Theological Seminary (Indiana, IN), where she held workshops on “Being the Church in the Digital Age,” and “The Virtual Body of Christ in a Suffering World,” as well as preach a sermon on “Reformation at 500 and Beyond.” Nov, 2017. The Virtual Body of Christ in a Suffering World was reviewed in the National Catholic Reporter, in a feature titled “Virtual Connectivity Helps Us Attend to Life’s Pain,” October 2017. Read the review here. The National Catholic Reporter also featured Deanna in a podcast interview, “Deepening spirituality through yoga and the internet.” Listen to podcast here. Deanna will be delivering the keynote address entitled, “The Viral Reformer and the Virtual Body of Christ: Learning from (and moving beyond) Luther in the Digital Age“ at the Reformation Festival at Luther Seminary, St. Paul, MN, October 27. Deanna will be delivering a keynote address on Commemorating the Reformation at St. Olaf College, Northfield, MN, October 19. This is part of their “Always Reforming: Nourished by the Past, Shaping the Future” series. Deanna will be keynoting the 15th Biennial DELKINA (Deutsche Evagelish-Lutherische Konferenz in Nordamerika) Conference in Toronto, October 14, 2017. Deanna will be keynoted the John Albert Hall Lectures at the University of Victoria, B.C., in honor of the 500th Anniversary of the Reformation, September 28, 2017. Deanna spoke on “Luther in an Age of Trump: A Feminist Proposal” at the Contemporary Perspectives on Luther Conference, August 18-19, Luther Seminary, St. Paul, MN. Deanna was interviewed by a podcast called Coffeepot Fellowship about faith and cancer and virtual support. Read more and listen to the podcast here. The Virtual Body of Christ in a Suffering World was featured on Syndicate, a forum for scholars interested in not merely reviewing new work in the humanities, but engaging it in substantive and diaological ways. Deanna is featured in John Noltner’s photographer/author’s new book, A Peace of My Mind: American Stories. The book features 58 people from diverse backgrounds share stories of hope, redemption, and forgiveness, paired with compelling color portraits in this 144-page, full color book with a foreword by Terri Lee Freeman, president of the National Civil Rights Museum. More information. Deanna put on a day-long symposium Monday, March 6th, 2017, viaHamline University’s Wesley Center. This year’s theme was “Healing, Wholeness, Holiness: Religious Responses to Trauma and Illness” and addressed the issues that Deanna is dealing with in her current book project: Glimpsing Resurrection: A Post-Traumatic Theology of Cancer. Deanna was the featured speaker at the Mount Olivet Lutheran Church’s Women’s Retreat “Women’s Weekend 2017: Re-Formed By Grace.” January 27 – 29, 2017. Deanna will be presented on ‘Martin Luther and the Ambiguity of Reform’ at the Minneapolis Institute of Arts on December 1. Deanna launched her new book, The Virtual Body of Christ in a Suffering World, on November 6 at Gloria Dei Lutheran Church. Deanna’s new book, The Virtual Body of Christ in a Suffering World, was featured in an online symposium for the humanities. More information. Deanna is one of the 2016-2017 recipients of a $40,000 Louisville Institute Sabbatical Grant. Her project is entitled, “Glimpsing Resurrection: A Post-Traumatic Theology of Cancer.” More Information. Deanna and her family and were featured on local public television affiliate’s (TPT) companion piece to “The Emperor of All Maladies,” the new Ken Burns documentary on the history of cancer based on the book of the same name. The TPT feature is called “Living Beyond Cancer,” looking at five local people who live with–and sometimes beyond–cancer. It first aired Monday, March 30, evening after the Ken Burns documentary. Watch the entire video here (Deanna’s part starts at 33:40). Deanna was the keynote speaker at the Academy of Parish Clergy annual conference, February 23 – 25, 2016, in Oviedo, Florida. 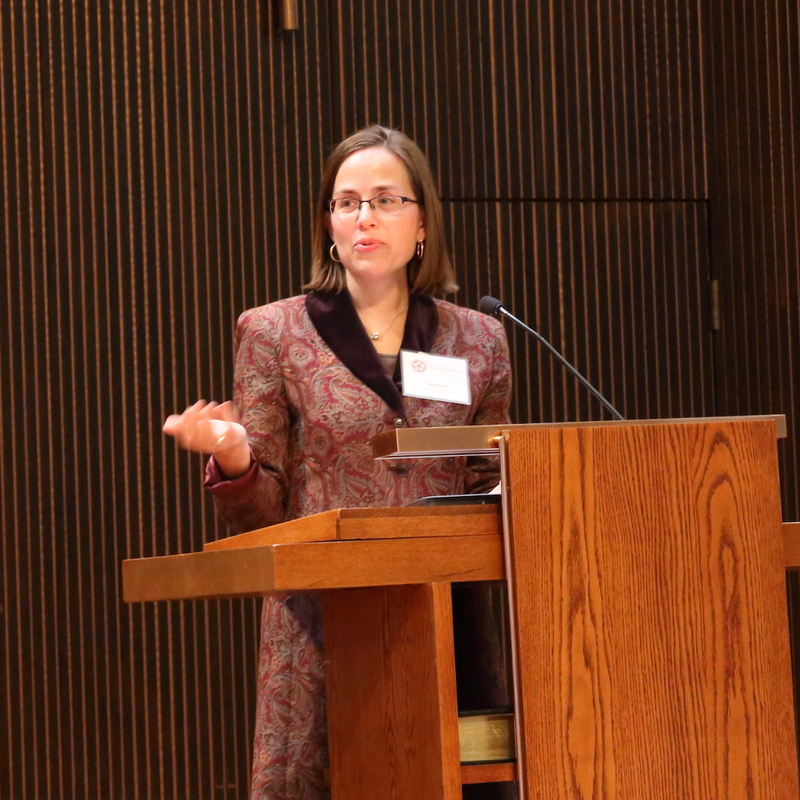 She delivered talks on: Deuteronomy: Why Clergy Should Care About the World’s Most Underrated Book; Wisdom from Hoping For More: Having Cancer, Talking Faith, and Accepting Grace; and Feminist Theology. Deanna was one of the featured speakers at a Leadership Summit at Hope Lutheran Church in West Des Moines, Iowa, October 22-23, 2015. Deanna will be spoke on the topic of her next book, The Virtual Body of Christ as well as leading a workshop on “Sustaining Hope in the Toughest of Times.” More information. Deanna’s review of J. Todd Billings’ book, Rejoicing in Lament: Wrestling with Incurable Cancer and Life in Christ appeared in the September issue of The Christian Century. Read the review here. Deanna wrote an article on “Living with Dying” in the March 2015 issue of Gather, a magazine of Women in the ELCA. Read the article here. Deanna spoke at Prince of Peace Lutheran Church, Burnsville, on “Talking Faith in the Toughest of Times: Right Words, Wrong Words, Words of Hope.” More information here. Deanna preached at the Westminster Presbyterian Church in Knoxville, Tennessee, where a classmate from Vanderbilt, the Rev. Dr. Buran Phillips, is pastor. Read the sermon here. Deanna wrote a blog post about her dear friend and colleague, Tim, on The Christian Century website. About Tim: “He hired me at Hamline and has been an incredible mentor and friend to me. He now has Alzheimer’s, and this post is a tribute to his scholarship, friendship, and faith.” Read the full post here. An expanded version of an earlier blog post of mine was just published with a Duke University Publication on Faith and Leadership. It’s about negotiating the effects of trauma in a post-diagnosis life. Read the post here. Deanna spoke on Hoping for More at the Ames Center in Burnsville, MN, M.O.M.S. 4th Annual Fall Brunch. Deanna spoke in Winnipeg, Canada, to new pastors in the Western Synods of the Evangelical Lutheran Church of Canada on “Being the Virtual Body of Christ in a Digital Age.” October 16, 2014. Deanna was the keynote speaker at Morningside College, Sioux City, Iowa’s Wright Lectureship in Christian Thought. October 9, 2014. Deanna was part of a terrific line up of speakers at the “Rethinking Faith Formation: Christian Identity and Practice in a Pluralistic World” conference at Luther Seminary in St. Paul, July 23-25, where she talked about the vital role of the virtual body of Christ in faith formation today. “The Fault in Our Stars” touches many relevant nerves in our family. Deanna’s daughter Linnea offers a review of the movie from the teenager’s perspective, thinking about what the movie and its message might have to say to religious communities in particular. Read “The Fault in Our Religion” here. Deanna has a piece on Huffington Post on the possibility of virtual communities forming in religiously significant ways around those living in the midst of the awfulness. The publication coincided with her presentation at Boston University on “Ecclesiology beyond the Institutional Church: the Virtual Embrace of the Traumatized” for students in a new chaplaincy track in the School of Theology and for a group of scholars who, under the leadership of BU Professor Shelly Rambo, are working on a new book on “Post-Traumatic Public Theology.” Read “Embraced by the Virtual Body of Christ” on Huffington Post. Deanna will be spoke at Shepherd of the Valley Lutheran Church in Apple Valley during their Adult Forum, 9:45-10:45 am, on issues related to “Hoping for More,” and building off of the blog posts I’ve written this winter. Join Deanna as she explores what it means to live in close proximity to the awfulness of life and still have hope. A new article published by Deanna Thompson called “Confessing the Faith in the Toughest of Times” (pp.19-21) appears in the Fall edition of INSIGHTS: A Faculty Journal of Austin Seminary. Hoping for More has been listed as the #3 bestseller for Cascade Books, ranked in the October 2013 “Fall Books” issue of Christian Century magazine. Deanna was the keynote speaker at the Lake Superior Conference of Women of the Evangelical Church in America, at French River Lutheran Church north of Duluth. A video was created for Hope Lutheran Church in West Des Moines by videographer Ryan Buck to tell the story of “Hoping for More.” It was initially created for a summer 2013 sermon series called “Since You Asked” for a sermon on “What do you do when a Friend Has Cancer?” The video is in four segments and closely follows the book. See video here. Deanna Thompson’s father, Pastor Merv Thompson, preached a sermon about what to do when a loved one has cancer last weekend at Hope Lutheran in West Des Moines, IA. The sermon is half him preaching and half a video of my story of “Hoping for More.” The preacher was preaching that day, and the videographer also captured well the grace amid the sorrow of living with a stage IV cancer diagnosis. To view the video, visit the hopeonline tv site, click on “Since you Asked” and go to the July 7 sermon. Deanna was part of a day-long consulting session of scientists and theologians with the authors of the forthcoming text: CHANCE, NECESSITY, LOVE: AN EVOLUTIONARY THEOLOGY OF CANCER by Steve James and Leonard Hummel. The authors draw upon HOPING FOR MORE as a significant resource for their theological reflections. Deanna Thompson was the featured speaker for several events at the Lake Region Cancer Care and Research Center in Fergus Falls, Minnesota in May, delivering an address at a dinner for medical professionals on the topic, “What do Patients Really Need from their Medical Professionals?” The address will be followed by a response from oncologist Dr. Margaret Barnes. Thompson also spoke at a lunch for patients as well as a breakfast for clergy and other religious leaders in the Fergus Fall area. Deanna recently published an article in the fall 2012 edition of the Journal of Lutheran Ethics, entitled, “Virtually There: Martin Marty, Cyberspace, and Cultures of Trust in the 21st Century.” Read the article here. St. Paul neighborhood newspaper, The Highland Villager, featured a story on Hoping for More and interview with Deanna in their October 24 – November 6, 2012, issue. See the story.